Reaper 2 a devastating weapon for drier lane conditions. Drilled mine with the pin above the ring finger and CG 2 inches below the pin. No extra needed. This was mucher cleaner down the lane than my Reaper and much stronger in the backend with significantly better carry. This ball ball will by far outsell the original Reaper. We just drill one of the Reaper 2 and used it on second shift league condition that this ball shined. It was able to get down the lane longer than the original Reaper, and with the added length I was able to get more backend. This is more of a dry lane ball and won't do much in heavy oil. With the density change in the core from the Reaper to the Reaper 2, you will notice that the Reaper 2 revs up faster and then unleashes on the backend. On a scale of 1-10, I would give this ball a 7. If you are looking for a drier lane condition ball, and you like backend punch, check this ball out. You can use a middle layout to calm down the backend reaction. If you are looking for something with more punch than the Nasty Nail Pearl on those drier conditions, then pick this ball up. Great ball for med. to dry lanes, drilled it up 4x5 just because I thought it might be too weak. The ball actually made a nice turn on the dry condition but hit any oil and it's a skate board but that's what I was looking for. Best med. condition ball I have seen out for awhile. I've been reading alot of bad reviews, about the reaper 2 and i have no complaints about this ball. It,s pretty much just drilled straight up nothing special the shot for my league is oiled 10 to 10, clean backends i've bowled 12 games with it in my league. I mean they changed the shot drastically 3 weeks before i got this ball and i could not score with anything else i got this and my average went up 11 pins so in my review i give this ball a rating of 9 out 10. I will make a prediction right now about this ball and I hope it doesn't come true. This ball will be overlooked by both Bowlers Journal, and also Bowling This Month as a pearl ball of the year qualifier. I have read the other reviews on this site about this ball and the reviewers that have expressed that they don't like this ball I believe have forgotten how to drill lower differential balls for maximum performance. This is a time in bowling where many very strong weight block balls are hitting the market. Some balls with differentials as high as .070 or higher, I mean these balls are flare monsters. I know from my own perspective, the first one of these I drilled for a customer I really should have drilled it stronger. With the pin in a stronger position for a certain bowler. I think that this is a ball that you really need to think long and hard about before you drill for a certain customer. You need to know all aspects of the bowlers game, from speed to revolutions to axis of rotation to tilt to lane surface they plan on usuing it on. But this is a pro shop operators job, we should all be doing this regularly, but some don't. I think these are the people that don't like this ball. I have seen nothing but performance out of the Reaper II. The ball gets through the heads as advertised, it flips on the backend like advertised and carries fantastic. This ball was not designed to be a ball that is used when the puddle is up in the middle, it's for when the puddle is going away. I thank companies like Faball for bringing balls like this back to the game. We need balls that don't just hook at your feet and you have to throw them as hard as you can to control, we need balls like this that different styles of bowlers can use. I think this ball fits in the category it was meant for, a powerful medium condition ball. I don't usually rate balls on this site, but I give this ball a 10 for flat out performance. Ok everyone. I had read every review on the Reaper & Reaper 2. Good & Bad. These balls are excellent when used as described by Hammer. I have both balls. There are both drilled identical using Hammer's "A" drill pattern. Both of these balls go exceptionally long. My Reaper will outhook the Reaper 2 by 3-5 boards. The Reaper 2 will go about 1-2 foot longer than my Reaper. I have used them on both slick and dry conditions. Neither ball will hook much on oil. Both balls will hook once they reach dry boards. The Reaper will over hook on exceptionally dry backends. 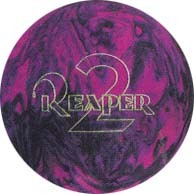 The Reaper 2 is much smoother on the same condition. Both hit like Mack trucks. My only complaint about both balls is I have left more 8 pins (I'm left handed) in the last 3 months than I have left in the last 3 years. Neither ball deflects when hitting the pocket. The main condition I bowl on is a 39 foot crown with freshly striped backends. Most houses I have bowled in I had to use Urethane because all the reactives I tried, would overhook on the backends due to the revs I place on the ball. The other reactives I throw are the Trimax II, STOMP Pearl, & Triton Heat. I drill all my equipment the same: Pin above the middle finger, or above & between the fingers with the CG directly under the pin in the center of my span. The Reapers are the first reaactive equipment I have found that gives me the length I need to throw reactive on most lane conditions I come across. They work as advertised on medium/dry & dry lanes. On the one slick shot I have tried them on, they slid to the pit. In that case, I pulled out my other reactive equipment. I rate both of these a 10 out of 10. Got this one used in a trade with user- Charles. Great guy to deal with. Anyhow, ball is set up with pin below bridge, cg slightly off center. Finished the surface off with a light coating of Finesse-It. In the limited experience that I've had with this ball I've been impressed. It is great for going up the boards and banking in off the dry. Like other reviewers have pointed out, it doesn't like oil. It needs to be find dry before it will turn over, but, once it does, it charges to the hole and hits like a train. I haven't experimented with trying to swing this one, but I imagine that high-rev guys could open up the lanes from deep inside with this one, given clean backends and a lot of axis rotation. I don't think this is the best use for this one, however. On fresh conditions, this ball is just the thing for accurate players who don't mind stroking the ball on a tight line to the pocket. On the other hand, it also works well when the lanes start to open up because it is still controllable but it offers more forgiveness. In summary, this ball is very user friendly, it hits like all Hammers (extremely hard), and is very good for its intended condition: light oil. However, it also shows versatility in that it can still be used effectively on fresh conditions, provided you have clean backends. Do not, however, expect any luck if there is oil on the backend. This ball needs dry to recover. If you throw it on carrydown you will, at best, leave soft corners all day, and, at worst, wash out constantly or rip through the beak trying to point it in the whole way. Use it on the right conditions and you'll love it. It's too bad that there aren't more of these floating around. This was another great Hammer release.